This page is concerned with different approaches to controlling a wheeled robot. The sketches on this page were made using the Seeedstudio Shieldbot (shown below). This is an Arduino shield with motors and wheels to which you can attach an Arduino Uno. The Wiki for the Shieldbot can be found at http://www.seeedstudio.com/wiki/Shield_Bot_V1.0. There is a link on that page to the Arduino library for the shield. There are also explanations of two of the examples that come with the library. The first of these demonstrates how to make the robot follow a black line using its infra-red line finders. The second demonstrates how to make the robot move. Although it doesn't state it on the page, digital pins 5 -10 (inclusive) are used to control the motors. Don't attach any devices to these pins. Also, when the line-following functionality is being used, all of the analog pins are out of action. With all this work already done for us, we need to think now about how we might control the robot for our own purposes. In essence, this means deciding on the inputs that will determine how the robot should move. There are many different ways we can do this. We can program the robot to move until it senses an object in its path. At that point we can make it turn in a predetermined or even random fashion. This makes for a robot that is autonomous, moving without any need for user interaction. Using an infrared sensor, you can achieve the same effect. An alternative is to use light sensors. If you place them pointing forwards at angles like two antennae, you can take a reading from each and make the robot move in the direction where it sense the most light. This would also have the benefit that of allowing you to use a light source (like a torch) to attract the robot in a particular direction. Once you are happy that the distance measurements are usable, you need to plan how the robot will move. Use the reference on the shieldbot wiki page to help you decide how to move in response to sensor readings. This sketch uses the parts from the DFrobot infrared kit (shown below). 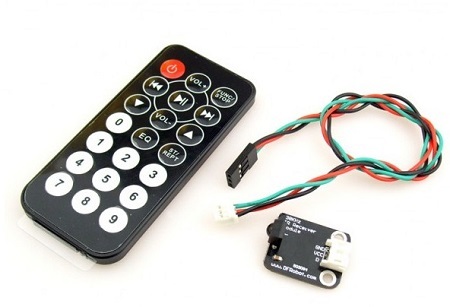 The kit consists of an infrared sensor and a standard remote control. The following is a very basic sketch using the stock code for the IR kit. I have not made the best choices for movement here and this doesn't give you a sense of complete control. Some of this is down to the way you take a reading from the sensor, some of it is caused by the choices made about how to move in response to the readings. The data pin for the sensor is connected to digital pin 11. #define FirstLastBit 15 // divide 32 bits into two 15 bit chunks for integer variables. Ignore center two bits. they are all the same. use pulseIn to receive IR pulses from the remote. IR pulses encode binary "0" as a short pulse, and binary "1"
if(pulse[i] > BIT_1) //is it a 1? else if(pulse[i] > BIT_0) //is it a 0?
} //verify first group of bits. delay for data stream to end, then try again. The most intuitive way to control the robot is with a game controller. A PS3 controller has 2 analog joysticks, a pressure-sensitive D-pad, 7 buttons on the top and 4 shoulder/trigger buttons. The extra inputs can be used for all sorts of interesting additions to the robot or the code. A PS3 controller connects to a PC or PS3 using either USB or bluetooth protocols. This example is based on the USB method and requires a USB Host Controller. For this project, I used the one made by Hobbytronics, with the PS3 firmware option selected. For the controller, I chose a third party wireless controller. I got the Speedlink Strike Fx. In most respects, this controller is inferior to a Sony version. The main issue is the lack of a genuinely full range of values from the analog switches.I also found issues with the rumble - including not being able to stop it rumbling if I connected in certain ways. However, there are good reasons for choosing this one. The main reason is for the wireless aspect. A genuine controller uses different protocols for its bluetooth and USB connection modes. A Sony version would have to have been connected via USB - not great for a robot. The other issue is that I didn't want the Arduino to have to provide the power for the controller. The Speedlink controller works very well in this sketch. 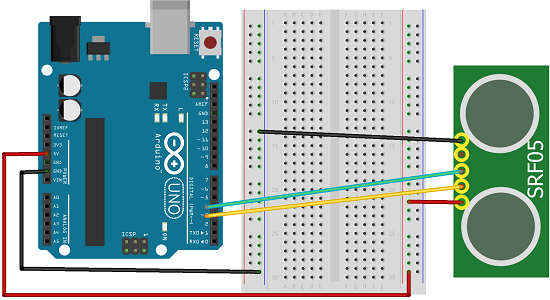 You connect the USB host board to the Arduino via I2C. Once you have connected 5V and GND, the SDA and SCL pins of the USB host need to be connected to analog pins 4 and 5 respectively. Then put the receiver dongle for the controller in the USB socket on the USB host board. I used the D-pad for control. Buttons have to be held down for movement. Much of the code in the sketch below is taken from the hobbytronics library. I have removed the rumble code. In the setup, you'll notice that the LEDs on the controller are turned on in sequence. This seemed to prevent the controller from rumbling constantly.